Kasienka’s father has left her mother and moved to England. The mother, persuaded that she can make him change his mind, uproots Kasienka’s whole life, fitting it into a suitcase and a laundry bag, and they arrive in Coventry. Forced to live in a bedsit, Kasienka and her mother must get used to life as Polish immigrants in Britain, where they are not always made welcome, where they are not always trusted. But there are others of course, like William who shares with Kasienka a love of swimming, and Kanoro, their neighbour, himself an outsider. Will they find Kasienka’s father? And when they do, will he actually be happy to see them? You’d be tempted to pick up this wonderfully titled little novel just because of the gorgeousness of its cover, illustrated by Oliver Jeffers. If you do, I won’t blame for this is one beautiful object, but rest assured, you will not be disappointed because The Weight of Water is just as beautiful on the inside as it is on the outside. Written as a succession of short poems, in verse, this coming of age story tackles the difficulties faced by young immigrants. Never soppy or over-sentimental, Crossan writes a tale that is not only about being an outsider, but also of finding one’s strengths, of standing up to bullies, of first love. All are tackled with a particularly delicate sensitivity. But what touched me particularly was that is was also about giving love a chance second time round, of embracing your life whatever it might throw at you. Full of sadness but also hope, this little book really moved me, and I found myself admiring the courage of a little twelve year-old wise beyond her years. 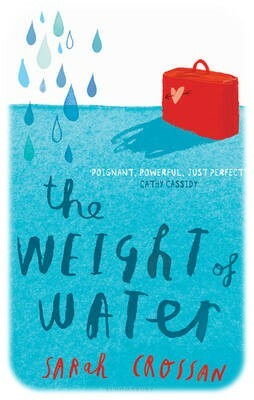 Many thanks to Bloomsbury Children’s Books for sending me a review copy of “The Weight of Water”. Sounds like one I would enjoy. Last week I read The Unforgotten Coat and loved it.